Jeremy Crutchley’s love of rock music and a fascination with the guitar began even before his love of the Theatre, where his career spans more than 30 years and many award-winning performances. Now at last he’s come back to that crossroads and laid down his debut album, simply called “RELEASE”. Jeremy also realized he needed a comfortable and inspiring zone in which he could patiently explore the many incarnations that his compositions had developed over the course of their evolution. ​He found his producer in Howard Butcher, of Peace Of Eden Studios, on the recommendation of Heather Mac (Ellamental). Jeremy recognized from the first phone call that here was an open-minded and compatible spirit genuinely interested in his work. After a further meeting to explore the project, Jeremy knew Howard would have the professional ability, sensibility and vision to capture and unify the differing moods and feelings in his musical ideas: so some rock dreams began to take focus into a rock reality. ​The creative connection was made and over a number of collaborative sessions they short-listed sixteen songs from a resource of thirty or more possibilities. These would be sifted even further and new material would also evolve during the sessions, including the title track. 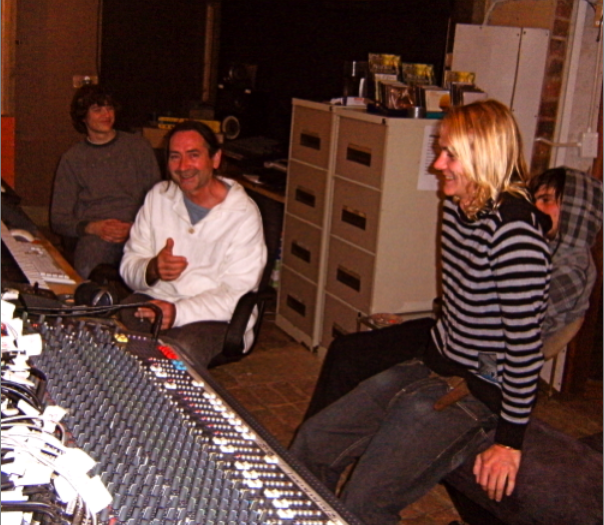 The 12 original songs were recorded over four sessions starting in November 2009 in the unique environment and nature reserve of Peace Of Eden Studios in Knysna, on the coast of South Africa, continuing until tracking was completed by the end of July 2010. Sessions were scheduled in and around Jeremy’s busy acting commitments in several different movies. This facilitated tracking core grooves and structures of each composition. Jeremy puts a heavy yet happy load on himself as the artist, playing all 6- and 12-String Acoustic & Electric Guitars, Mandolin and Bass. Long creative days gave way to equally long inspiring nights where every facet of creativity was explored in the studio, amidst the good humour of Crutchley’s ever-changing personas, keeping the vibe alive and the performance energy up. Gradually the feel and flavour of the album developed. The core production team of Howard Butcher and Thomas Jacobsen, kept the project alive and held things on course – even when the volatile number “Gunman” seemed to have fought its way mysteriously out of the computer’s memory banks! ​The shaping of the elusive qualities of the acoustic and electric guitars is a particular highlight of the fine engineering to be heard throughout “Release”. ​The name for his sound as well as for the band, (which still did not officially exist at that time), had been haunting him during recording; he called this new presence “THE STANDING WAVE”. For its first incarnation, Jeremy Crutchley is supported here by some brilliant guest artists, (see full credits on album cover) among them James Kielczynski on drums and percussion and the unique voice of none other than Wendy Oldfield – both of them appear in the first rock video to emerge from this album! And along with several award winning actors, there’s even an unusual guest appearance by Howard himself…a rare sighting indeed. It’s a sound that’s essentially got it’s heart and soul firmly in blues-rock, diverse, progressive and retro, unafraid to tread gently, and yet ready to get down and rock hard …even right on into a triumphant African Mbaqanga beat in “The Coolest Thing (I Ever Done)”. This song, along with “Walking In High Heels” was first broadcast on UCT Radio 104.5FM on December 5th 2010. Jeremy has now written, directed & produced the rock video for “Walking In High Heels”, track #4 from the album, shot recently in Cape Town. An edgy, upbeat, surreal, layered and engaging mini-movie that follows the kick and sensual feel of the number. Entertaining too : you may want to repeat the experience… Feel the effect of The Standing Wave.